Premiership champions Saracens ran in six tries to thrash Worcester in the London double header at Twickenham. 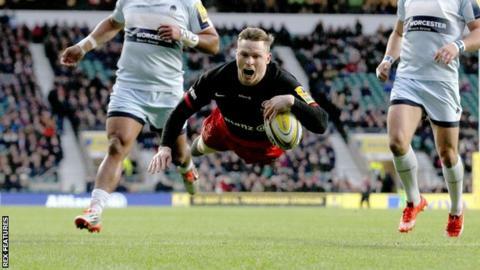 Chris Ashton grabbed tries in both halves as Sarries recorded their 10th consecutive win in all competitions. Ben Spencer, Schalk Brits and Ben Ransom also touched down for the bonus point, while Joe Rees and GJ van Velze scored late consolations for Worcester. Saracens fly-half Charlie Hodgson kicked 18 points, taking his Premiership career tally past 2,500. In the week he announced his decision to retire at the end of this season, the 35-year-old British and Irish Lion settled into his stride with two successful kicks before half-time as Sarries took a 14-point advantage into the interval. Ashton set Saracens on their way with a fourth-minute try. Scrum-half Spencer burst through a midfield gap before intelligently kicking crossfield into space out wide for the former England winger to run in unopposed. It came shortly after Saracens lost captain Alistair Hargreaves inside the opening minute for a clash of heads with Worcester prop Nick Schonert. Hargreaves' second-row replacement Maro Itoje combined on the blind side with winger Chris Wyles on a turnover to open up the space for Saracens' second try, with Spencer collecting the pass inside to race away for the breakaway score. Jackson Wray was denied a try when he failed to cling on to the ball in a lunge for the line, but the flanker was to make up for his error in the second half, finishing off a catch-and-drive line-out under the posts - this time to the satisfaction of the television match official. Hodgson played an integral part in his side's bonus-point fourth try. Rather than making a dash for the line himself, he opted to pass inside for Ashton's second of the afternoon, but the conversion saw the former Sale man go beyond 2,500 Premiership points for his career. Brits bundled over for a fifth try from a rolling maul before full-back Ransom finished off a sweeping move after Worcester had been reduced to 14 men by Phil Dowson's yellow card. Dean Ryan's side claimed the last two scores on the day, but were never close to threatening. "We're all delighted that Chris scored. "Like a good centre forward in football, Chris is one of those great wingers who judges everything that he does on scoring. "If he doesn't score then he's not satisfied, which I think is a pretty good trait for a winger to have. "In actual fact, his first six games for us this season have been as good as anything that he's produced in his whole time at the club." "We always knew it would be a tough day. We always knew coming into the Premiership that we would take some petty serious dents. "It would be unrealistic to think that we could jump across competitions and then immediately jump to the top end of that. "This was a sobering lesson but one that we're prepared to take to get better." Saracens: Ransom; Ashton, Bosch, Barritt, Wyles; Hodgson, Spencer; Gill, Brits, Figallo, Kruis, Hargreaves (capt), Wray, Brown, Joubert. Replacements: Saunders, Barrington, Lamositele, Itoje, Vunisa, de Kock, Farrell, Tompkins. Worcester Warriors: Pennell; Heem, Olivier, Mills, Vuna; Heathcote, Arr; Leleimalefaga, Annett, Schonert, O'Callaghan, Barry, Dowson, Betty, van Velze (capt). Replacements: Bregvadze, Rapava Ruskin, Rees, Cavubati, Cox, Mulchrone, Lamb, Howard.